Tag line: "A lawman and his sons face the ultimate test of courage"
J.D. 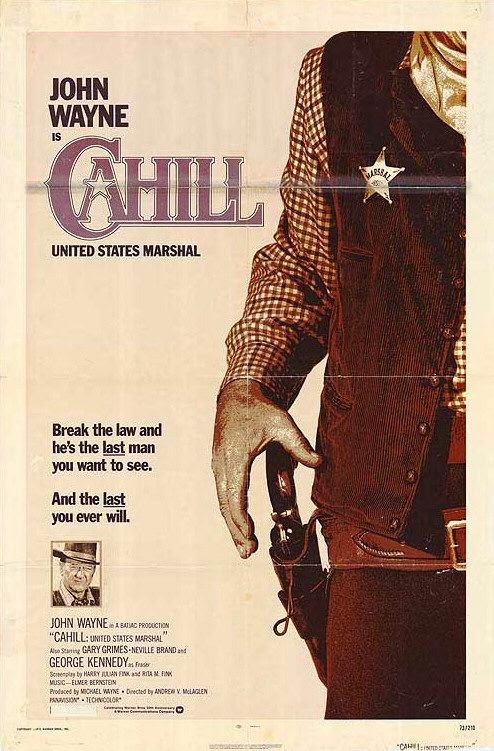 Cahill (John Wayne) is one of the toughest U.S. Marshals in the territory, but the time he spends away from home has taken its toll on his two sons: 17-year-old Danny (Gary Grimes) and 11-year-old Billy (Clay O'Brien). With an absentee father and no mother to look out for him (she died a few years back), Danny has fallen in with a bad crowd, and recently joined a gang headed up by a gunslinger named Fraser (George Kennedy). After staging a barroom fight to get themselves arrested, Danny, Fraser, and the other members of the gang, Struther (Morgan Paull) and Brownie (Dan Vadis), sit quietly in jail while young Billy starts a fire in a nearby barn. When the whole town, including Sheriff Grady (Walter Barnes) and his deputies, rushes to put the fire out, Billy walks into the jail and opens the cell doors. If everything goes well, Fraser and his gang (Danny included) will rob the bank, then return to their jail cells before the fire is extinguished, thus giving them the perfect alibi. Their foolproof plan goes awry, however, when the sheriff realizes the bank is being robbed and tries to stop it. A gunfight ensues, and Sheriff Grady is shot dead. The next day, J.D. returns home and, after getting Danny out of jail, begins a search for the bank robbers. Aided by both Danny (who he deputizes) and Lightfoot (Neville Brand), a half-Comanche tracker, J.D. heads into the mountains, where he comes across four men who seem to be on the run. J.D. arrests them for the bank robbery, and after a quick trial all are found guilty and sentenced to hang. But will Danny’s conscience allow him to sit back and watch as four innocent men pay for a crime he himself helped commit? One of John Wayne’s last films (released a scant 3 years before the Duke’s final screen appearance in 1976’s The Shootist), Cahill U.S. Marshal is, alas, a mediocre motion picture. While Wayne delivers one of his typical performances, playing J.D. as a gruff but dependable lawman, the two actors portraying his sons (Gary Grimes and Clay O’Brien) come up short in nearly every scene (especially young O’Brien, who struggles whenever the tension ramps up), which is a problem when you consider half the movie is dedicated to them. On top of this, the dialogue is often heavy-handed (during one of the film’s quieter moments, J.D. tries to explain to Danny why he’s away so much. “Your mother, God bless her”, J.D. says, “When she was dyin’, the last thing she said on earth was ‘Go get ‘em, J.D.’, and I’ve been goin’ and gettin’ ‘em ever since”), and there are times when even the set pieces betray the filmmakers (in one scene, Fraser and his henchmen are chasing Billy through the streets during a rainstorm, hoping to find out where he hid the money. They pause for a moment, and in the background the rain is falling in two different directions, a clear sign that the studio’s sprinkler system, and not Mother Nature, was responsible for the downpour). The Duke’s most ardent fans may enjoy Cahill U.S. Marshal (aside from Wayne’s solid performance, the scenes shot on-location in Mexico lend an air of authenticity), but for those simply looking to delve into some of the actor’s later work, there are better movies (Rooster Cogburn, The Shootist) out there for the taking.